The Culkin School is proud to associate with some of the area’s best traditional Irish musicians. 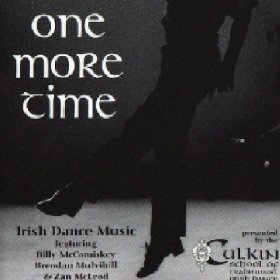 Several years ago we teamed up with Billy McComiskey, Zan McLeod and Brendan Mulvihill, world renown musicians residing in the DC area, to produce an Irish dance practice CD. This amazing practice CD consists of reels, jigs, slip jigs, single jigs and hornpipes played at slow, medium and fast tempos allowing dancers to practice new steps at a comfortable speed as they learn. Once a step has been mastered, dancers can practice their steps to CLRG sanctioned speeds required for competition. All tracks are played in precision timing using a metronome. Apart from being a pure pleasure to listen to; the CD forms a key part of our student practice sessions at home and can do the same for YOU! It’s as easy as 1-2-3 to get your practice music! Download the speed that is right for YOU! To download the entire”One More Time” CD or download the one perfect track for you, just click the “AVAILABLE ON iTUNES BUTTON”!